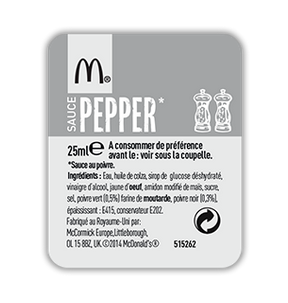 Throughout our week in France, I probably entered 10 different branches in search of this limited edition sauce. I only did this because of the kiosks that McDonald's have there, since it only involved two screen taps, I could be in and out of the restaurant within 20 seconds if I saw that it wasn't available. If I had to queue up and actually speak with a cashier, I know I wouldn't have bothered. I found it available only in a lone branch on our last night in Paris, so I was pretty happy with putting in the effort. The Pepper Sauce was launched alongside the "Spicy Thai" sauce a couple months ago, and was nearing the end of their run (all references to them were removed from the official website on 1 Aug). Since I wasn't interesting in ordering expensive nuggets in Paris, I carried this sauce back to Singapore, where the nuggets are still shockingly overpriced, but I was able to use the "McChicken method" to save $3+. Unfortunately all the effort I put into finding this sauce and bringing it back was wasted since this was hands down, the worst nugget sauce I've ever had, from any country. When I opened the packet, there was a layer of oil that had congealed on the top of the sauce, and even when I tried to stir it around, it remained gelatinous. It infact was so firm, that I thought the sauce had spoilt. I double checked that for some reason, it was meant to stay refrigerated, and I also gave it a safety sniff before my first real taste...It didn't smell rancid, strangely, didn't have any odour at all.